Oysters are like most marine invertebrates. Eggs and sperm are released into the water column and a fertilized egg will develop into a veliger larva. The larva spends 3-5 weeks in the water column until it becomes competent to settle (Kennedy 1996). The settlement of oyster larvae is governed by several factors including substrate type, orientation, and other chemical cues (Hidu and Haskin 1971, Hopkins 1931). Oysters are gregarious and immobile, so these cues are important factors in the formation of oyster reefs, an important and threatened habitat globally (Beck et al. 2011). Once the larvae settle on shell or other hard substances, the term 'spat' is applied which is defined as a juvenile oyster, less than 100 mm from the umbo to the shell margin. Spat settlement rates are collected at 9 sites in San Carlos Bay and Tarpon Bay to determine the short and long term health of a site and determine the likelihood for restoration success. Temperature, salinity, and the phase of the moon (spring tide cycle) are important. However, local hydrodynamics and freshwater flow rates can have a large influence on salinity and temperature. 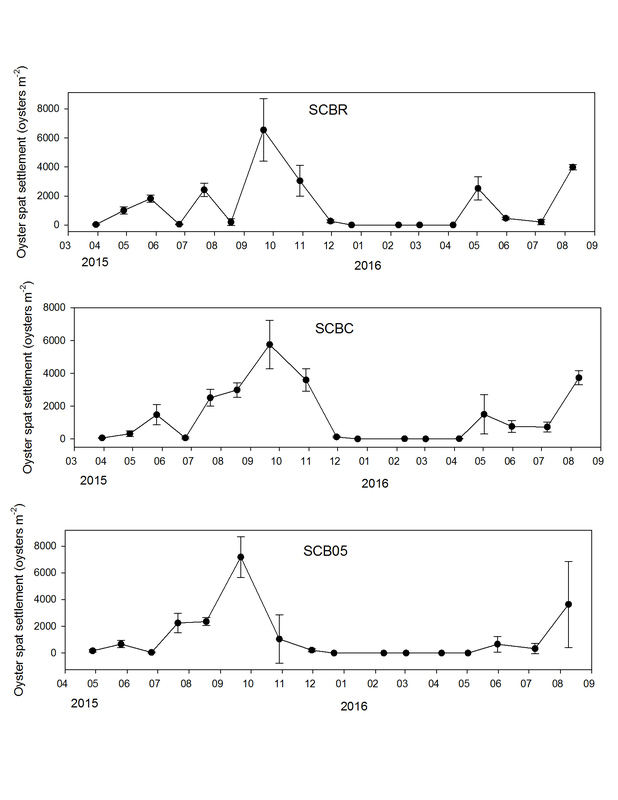 A time series graph of 3 oyster reef sites demonstrates the effects of high flow and low salinities on settlement rates. The 2015-2016 El NIno caused high rainfall and flooding. Regulatory discharges from Lake Okeechobee and runoff resulted in significantly lower oyster spat settlement in San Carlos Bay in 2016 compared to 2015. Peak settlement occurred in October 2015 at all sites with settlement rates from May through October significantly greater in 2015 than 2016. Oysters spawn when water temperatures are consistently above 77 degrees F (Menzel et al. 1966). Spat setting is usually less at low salinities, with consistent settling occurring at salinities from 16-22 and peaking at 20 (Chatry et al. 1983).